In a recent post Immunization via Vaccination we presented a brief outline of the moral, scientific, and civil law aspects of vaccinations. In particular, we noted that in the past there have been “problems with the mercury-based preservative Thimerosal in certain vaccines”. Since then I have learned that some have claimed a link between vaccinations in general, and Thimerosal in particular, to autism. Others have claimed that there is no such link. In any event, Karen Jamrog’s recent article in New Hampshire Magazine (September 1, 2008), The Mysteries of Autism: So many questions — so few answers caught my attention. Although Jamrog’s article focuses on autism and its possible causes, it also goes a bit deeper into the topic of vaccinations from the scientific perspective. Boys are four times more likely to develop autism. Autism is one of a group of neurologically-based developmental disabilities called autism spectrum disorders (ASDs), which are conditions that feature substantially impaired social interaction and communication skills and unusual behaviors and interests. Other ASDs include Asperger syndrome, Rett syndrome, childhood disintegrative disorder and pervasive developmental disorder not otherwise specified (PDD-NOS). Boys are four times more likely than girls to have ASDs, which occur in all racial, ethnic and socioeconomic groups, according to the Centers for Disease Control and Prevention (CDC). The effects of ASDs vary widely, from mild to disabling. Can vaccinations directly cause autism? Autism frequently makes headlines in the news, often highlighted by debate and controversy. Although countless research hours and dollars have been spent studying autism, much remains to be understood about the disorder, including why there has been an uptick in cases, and whether childhood vaccines are to blame. … There is also uncertainty surrounding possible causes of autism. An emotional maelstrom continues to swirl around the idea that thimerosal, a mercury-based preservative used in children’s vaccines, causes autism. Scientific studies have refuted the idea that vaccinations directly cause autism, and the federal government has worked to eliminate thimerosal from childhood vaccines, but some people still cling to the idea that vaccinations put children at risk. Symptoms associated with autism appear before a child reaches his or her third birthday, which is around the same time that children routinely make consistent visits to their pediatrician and receive vaccinations, points out Dr. Laura Rubin, a clinical psychologist and founder of the Portsmouth Neuropsychology Center. So maybe it’s possible that the relationship between vaccines and autism is more coincidental than causal, some say — just a matter of timing. Although I only casually follow the medical literature on autism, I’m certain that further research and studies are currently in progress since this seems to be a popular area of current focus. I would be interested to see what these future investigations reveal. "Editor's Note: Due to content that some reader may find offensive, Dilbert will not run for the next four days." Well, it’s a ‘satire’ about Jesus and the Twelve Apostles. Scott Adams certainly knows that we are almost at Holy Week and Easter. (Another “rarity” is Easter coming so early this year. It won’t be this early again until 2160!) His response is ‘time make fun of’ Our Lord. Our response to this should be to grow in holiness. Perhaps this is a good opportunity to examine our conscience to always respect the sentiments of others. Cartons or other things that make light of the truly sacred for others or the authentic cherished beliefs of others are signs of intolerance. Humor quickly looses its appeal after mature reflections of this sort. Dilbert’s “HAY-SOOS” panels began on March 8, 2008. Dilbert’s Date: Do you have any hobbies? Dilbert: I like to read obscure articles on the internet and imagine having friends who are interested in the same thing. Dilbert’s Date: But you do have friends, right? Dilbert: Is it too late to change the subject? 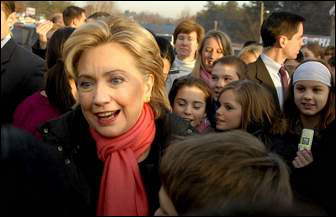 2008 New Hampshire Primary: They came. We saw. We voted. They left. Well, this past Tuesday New Hampshire held her Presidential Primary Election. Every 4 or 8 years New Hampshire becomes the center of the political universe …and then they’re gone. The Republicans and Democrats voted for their delegates with John McCain and Mrs. Clinton winning top votes, respectively. The small number of delegates that individual candidates won pale in comparison to the votes needed for their parties to nominate. Nevertheless, momentum and “perception of a winner” is integral to this process. In New Hampshire we’ll have to sit back and be spectators as other states select their delegates to the national conventions: RNC September 1st in Minneapolis-St. Paul, MN and DNC August 25th in Denver, CO.
Republican Senator John E. Sununu, will be challenged by Democrat James Buckey . Buckey is a physician who unfortunately supports legal abortions. He is a safe scratch. Our only two-year governor in the nation, Democrat John Lynch — a winning smile indeed — will be challenged by Republican Joe Kenney , from Wakefield, NH and by Republican State Representative Bea Francoeur of Nashua, NH. Senator John F. Kerry’s seat will be contested. (He recently endorsed Illinois Senator Barack Hussein Obama). The contenders are currently fellow Democrat Ed O’Reilly, an “impeach President Bush/ VP Cheney — homosexual ‘marriage’ as good” type; Republican Kevin P. Scott , 44, of Wakefield, MA, — speaks Russian and is a Member of the American Association for the Advancement of Slavic Studies , “no amnesty — killing of unborn children decided by states”; Republican Jeff Beatty . It’s too early to tell if either Scott or Beatty are viable in defeating Kerry in Massachusetts. 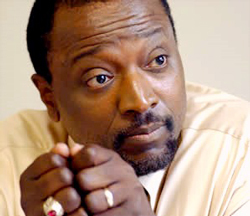 It’s going to be really interesting to see how Republican Presidential candidate Alan Keyes (b. 1950) fares in the January 8th New Hampshire Primary. Almost a week to go! He entered the race late on September 14th and does not seem to have any discernible momentum. I’m sure most people do not even know that he is once-again running. He also ran in 1996 and 2000. Keyes is certainly on the side of the good — the sane side — in regard to the moral issues of our day, especially respect for women, children and the family. The common good and the future of the United States can be served well with the help of a President with high moral principles and courage to act on them. His domestic and foreign policy positions likewise are reasonable and sane. If you are a “values voter” (i.e. a normal person) and are considering, Mitt Romney , John McCain , Mike Huckabee or Ron Paul then please give Alan Keyes a look. In addition to “values”, “leadership” will be an increasing important aspect of choosing the next President of the United States considering the certain challenges of Iran, Iraq, Afghanistan, North Korea, Pakistan and the like. From the group above Romney and McCain are naturally the first choices since they have far better “name recognition” than Keyes. Nevertheless, Keyes is certainly well-positioned for Presidential leadership. He has served as diplomat in the US Foreign Service for many years, has a great education, and took the initiative to run in many Senate campaigns. Does Alan Keyes have much of a chance to win New Hampshire, never mind in other states? Probably not. He, like the rest of us, most likely knows that he doesn’t have much traction in this election cycle. His candidate stature probably will not improve unless someone drops out —Huckabee or Paul? — and endorses him. Nevertheless it is refreshing to, once again, see Alan giving a sane moral voice without compromise to election politics. The January 8th New Hampshire Presidential Primary will be here in no time. Unfortunately, most of the major candidates, both Democrat and Republican, fail the pro-life, pro-family, pro-faith “litmus test”. So conscientious citizens have to do the best they can in weeding out those who would do the most damage to the common good. In addition, both leadership and experience should always factor into one’s voting decision. While some “litmus tests” are just, ones that eliminate a candidate based on age are not. 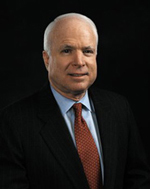 Arizona Senator John McCain (R), 71, has the experience to lead America. In addition, although not perfect, he certainly strives to be a man of moral courage and solid principle. Recently he spoke with some Catholic leaders about his position on human life and other issues. (Although his responses can give a conscious person pause, it seems that McCain does not want to "flip-flop" at this point on any issue — a political calculation for sure. So we should remember that the United States will have a Presidential election, not a papal conclave or general chapter.) I hope he goes far in the Presidential election process. We don't agree with him on every issue. We disagree with him strongly on campaign finance reform. What is most compelling about McCain, however, is that his record, his character, and his courage show him to be the most trustworthy, competent, and conservative of all those seeking the nomination. Simply put, McCain can be trusted to make informed decisions based on the best interests of his country, come hell or high water. Competence, courage, and conviction are enormously important for our next President to possess. No one has a better understanding of U.S. interests and dangers right now than does McCain. He was right on the mistakes made by the Bush administration in prosecuting the Islamic terrorist war in Iraq and he is being proved right on the way forward both there and worldwide. McCain is pro-life. Always has been. He fights against special-interest and pork-barrel spending, and high spending in general, which ticks off liberals and many in the GOP who have wallowed at the public trough. Yet he also has the proven ability, unique among the contenders, to work across the political divide that has led our government into petty bickering when important problems need to be solved. With these endorsements he is both “viable” and may be “the comeback kid” in 2008! Bishop John McCormack, Catholic Diocese of Manchester, presented a nice guide on conscience in the political process last weekend: Conscience and Your Vote. It is not a voters’ guide but rather a nice presentation on forming one’s conscience at election time. It is well worth a look. Related post: John McCain: "Faith of My Fathers"
A Soul Finds "the box"
Utter Muttering presents very nice testimonial on how he found his way to the confessional "box" after a long absence! He responded to Our Lord's initiative and received His healing, forgiveness and mercy through the ministry of His ordained priest. Perhaps his soul is alive again (I'm not sure if he had any mortal sins to confess). Regardless, his "soul of the soul", anima animae, is alive. This surely won't make the news but the world had changed for the good today! Actually helping people and making burdens easier ... quite edifying indeed to say the least! Dear Catholic readers, when was your last Sacramental Confession? On a beautiful and cool late summer day the so-called “Latin Mass” made a return after 40 or so years to Nashua, New Hampshire. 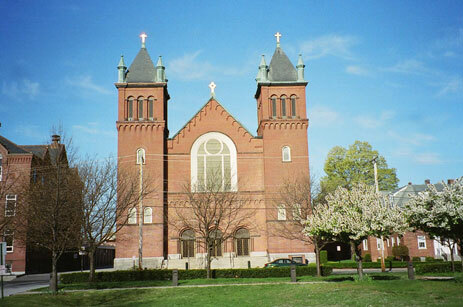 More precisely, the extra-ordinary form of the Latin Rite according to the 1962 Missal was celebrated today at St. Patrick’s Parish (Roman Catholic Diocese of Manchester). We are fortunate to have a pastor who is willing and able to celebrate this form of Liturgy for his own benefit and the benefit of the faithful. The Altar Cards have been in place for the past few weeks and we all knew that Fr. Kelly was preparing for his first 1962 "Latin Mass" as a priest. However, no one knew what the turnout would be. Nostalga or novelty may have been partly in play, but given my estimate of 600 or so who participated at the 4pm Eucharist, I suspect something of a deeper attraction to this Rite as an expression of the Catholic Faith than mere sentiment or curiosity. (The Nashua Telegraph reported "over 600" participated). It was great to see so many young families and youth in the mix along with the older people who may have participated —"in the day" — in this pre-Vatican II-origin Latin rite liturgy. Related Posts: Summorum Pontificum, A comeback for the Tridentine Mass? Nashua Pride Win Cam-Am Championship! The Nashua Pride , led by manager (and former Boston Red Sox third baseman and manager) Butch Hobson and off-season acquisition and closer (and former Boston Red Sox pitcher) “El Guapo” Rich Garces, won the Can-Am League Championship tonight at Frazier Field in Lynn, MA! 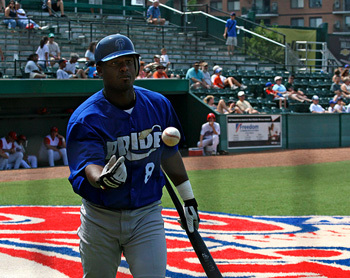 The Pride previously won the 2000 championship in the Atlantic League. The Can-Am league is a step down from the Atlantic League. These two professional leagues are not affiliated with any Major League Baseball (MLB) club. Both leagues are a step-down from single A ball. However, each year a handful of players in the Can-Am League work their way back to MLB-affiliated club — and even some to MLB rosters outright. Unfortunately tonight at Frazier Field may have been the last we will ever see of these two clubs. The North Shore Spirit will fold at the end of the season because of lack of attendance. The Pride may also fold for the same reason. However, the Nashua club may also be relocated to Ottawa or some other city. The Pride’s owner John Stabile would like to keep the team in Nashua. However, he is unwilling to continually suffer financial losses because of low attendance and sparse sponsorship. Currently he is looking into some sort of city or state partnership that will keep the team financially afloat. $800k is what it will take according to news accounts. Perhaps their recent championship and the reality of not having local professional baseball in Nashua will convince another owner (or partnership arrangement with Stabile) to pursue this venture for the good of the community (at least). Perhaps the right marketing team could attract more interest in this level of baseball. If you have a spare $800k, love baseball, and would like to be an owner then I’m sure John Stabile would love to hear from you! First there was simply "Hillary". We all know her. Then there was "Rudy". Most know him. And now there is "Fred". Love these first-name-only candidates! 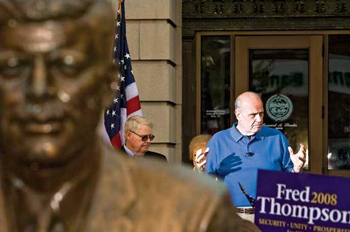 I'm sure Fred — as in Fred Thompson —will become more well-known as the 2008 US Presidential campaign season hits full stride. Make no bones about it Fred is a viable contender because —as we all know— all viable presidential candidates —as well as some not so viable— first come through Nashua, New Hampshire on the road to the White House! Thompson spent about an hour outside City Hall talking to voters and answering their questions about his priorities for the country, his plan for a workable health-care system and the war in Iraq. Throughout his visit, Thompson stressed conservative principals of low taxes, smaller government and a competitive economy – message was received well by the fairly vocal crowd. Security is at the top of Thompson's priority list, he said, because of the availability of weapons of mass destruction and terrorists who have declared war on the United States. That, combined with the country's "open borders," make for a dangerous situation, he said. Thompson said he supported the decision to send troops to Iraq rather than let Saddam Hussein continue his abusive reign. Diplomacy and U.N sanctions weren't working, he said, and if Hussein had obtained weapons of mass destruction, he would have been a danger to the U.S.
Thompson dismissed claims that he’s entered the race too late. He pointed out that before this year, a September announcement wasn’t considered late at all. "I'm going to be in New Hampshire a lot," he said. "I'm going to be talking to real people." Thanks Fred for acknowledging Granite Staters as "real people"! We may even reciprocate in kind after viewing your campaign site. Yes, that is a bust of J.F.K. in the foreground of the photo. 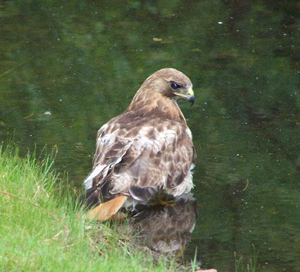 We’ve been finally able to identify the hawk that we’ve seen in South Nashua (New Hampshire) in the past weeks. It is a Red-tailed hawk . I’ve personally encountered this raptor “up close and personal” on one occasion! Several times I've seen it happy enjoying some "dinner." This bird flies silently and is very handsome. It tends to give a Parthinian shriek after a “personal” encounter. From what I’ve read its native range is most of the United States but retreats south of Vermont and New Hampshire in the colder months.